I wasn't aware of a new GZDoom release. Normally it shouldn't mess with sbarinfo stuff like this. I cannot see anything significant in the changelog that would explain a change of code behavior. I noticed that the texture system got a revamp in 3.7.0, though. Since the split statusbar completely relies on a textures lump, it would probably break if significant changes to declarations etc were applied. However I find that hard to believe since developers usually try hard to maintain compatibility to older mods with deprecated code. In your screenshot you can clearly see that the bar is cut in completely different places and assets like the mugshot background (black square) are placed incorrectly. This indicates that positions defined in textures lump are not properly interpreted. I assume the normal (non-split) version works properly? I cannot test this by myself before next week, but I am strongly tending towards this being a problem with GZDoom. If stuff doesn't work any more the way it did before, that's usually the case. Unless you are loading other mods affecting the statusbar, of course. Be sure to check your launcher settings (if you are using any) and autoload sections in your gzdoom.ini file. Seems like he has your wide Doom HUD in autoload. Well, in that case: Please remove the widescreen mod from autoload. It's either one way or the other, but you cannot use both at the same time. Awww, yeah, thanks! I could have known it myself, completely forgot of that autoload stuff (that was not in autoload folder tbh). Please never mix widescreen graphics with this mod. It's based on the original graphics and will obviously cause problems otherwise. Is there any way to get the border (the green thing?) of the HUD back? I came across this because I wanted a HUD that looked like vanilla but showed level stats. Is there anything I can edit in the pk3 to get the green border to the sides of the hud back? That's not exactly the purpose of this project, but OK. Load the file attached below after the actual status bar mod and see what it does for you. Don't forget to leave fullscreen mode, this is a mod for the normal version of the HUD. And you shouldn't have transparency activated for this, either. Oh, btw: This status bar IS 100% vanilla (provided you do not activate transparency or Boom colors). The green border tiles weren't exactly there in the first place in original Doom since widescreen did not exist back then. GZDoom adds these to cover the gaps since nothing is drawn underneath them in non-fullscreen mode. Thanks! I wasn't expecting such a quick reply, plus a file! I feel like there should be some kind of widescreen status bar support implemented, because some PWADs, like Pirate Doom for example, use a widescreen status bar by default, with no option for a regular status bar which would be compatible with this HUD. Implementing widescreen status bar support for this will be kinda difficult since these graphics may have different sizes, which means cutting the graphics at different spots would be required. IMHO authors should not include widescreen graphics directly with the mod, but as external/optional files. If this is possible to do with code, I would definitely need help with it since I have no idea how to pull it off. It would be a nice addition indeed. Right now this mod really only works if STBAR dimensions remain unchanged (for Doom: 320x32). 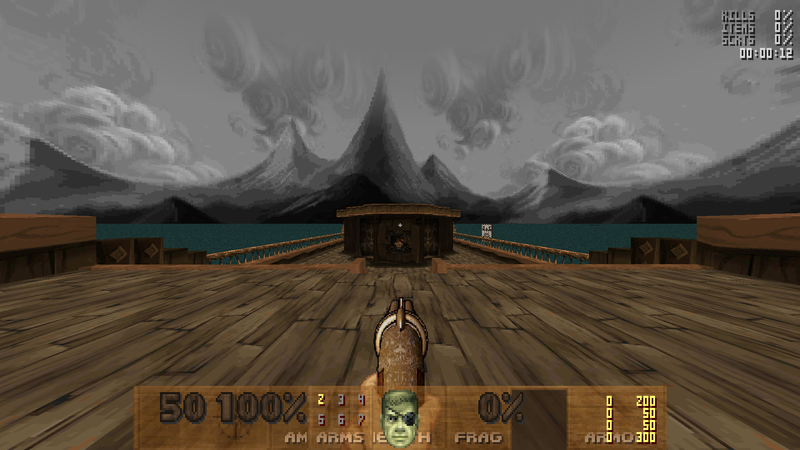 Anyway, I have created a patch for Pirate Doom which you should load AFTER the mod and the pwad (since that one also comes with its own SBARINFO which would override mine). This patch should also work for any other pwad that uses STBAR replacements with a width of exactly 486px, e.g. "Rise of the Wool Ball". Is there an edit somewhere with this functionality? That's why I decided to place the stats in the upper right corner where they are not obstructing anything (and in Heretic and Hexen it's just about the powerup icons that are in the way). I never considered placing the stats at the bottom, actually. Hi, really like this HUD, but I've noticed it's not Brutal Doom compatible. Ammo count always shows as zero. Any chance of having compatibility. NightFright wrote: That's why I decided to place the stats in the upper right corner where they are not obstructing anything (and in Heretic and Hexen it's just about the powerup icons that are in the way). I never considered placing the stats at the bottom, actually. Yes, this works well. I made that comment before realizing you had been making additions to it. I love the split stbar feature. I also grabbed all the stbar fixes from the link you sent me, do you know if there are many more wad stbars that might need fixes like those? I can take a look at Brutal Doom compatibility, even though I think the mod offers a better HUD which suits its needs. There are many pwads out there and I cannot test them all. If I didn't cover a mod which doesn't work 100% with this, just mention it here and I'll look into it.